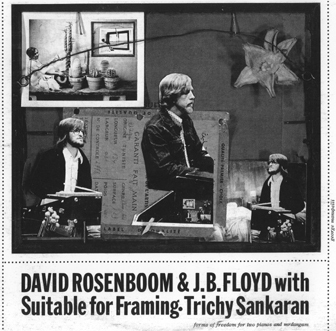 Spanning a long period of years, David Rosenboom and J.B. Floyd maintained an extraordinary two-piano duo, performing extensively in North America and Europe, recording and with the Toronto-based improvisation group, Light. They developed an extensive repertoire of music, including many works by themselves that employed a unique variety of techniques for structured improvisation in open form compositions. Major recordings include: Suitable for Framing and Predictions, Confirmations & Disconfirmations.